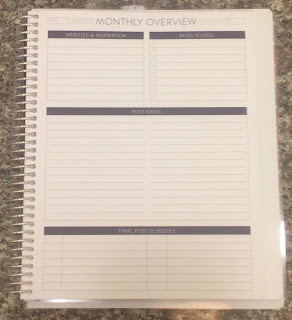 I intended to wait until closer to the new semester to talk about planners, but I just got my new one in and I'm so excited that I can't wait until the summer is almost over! 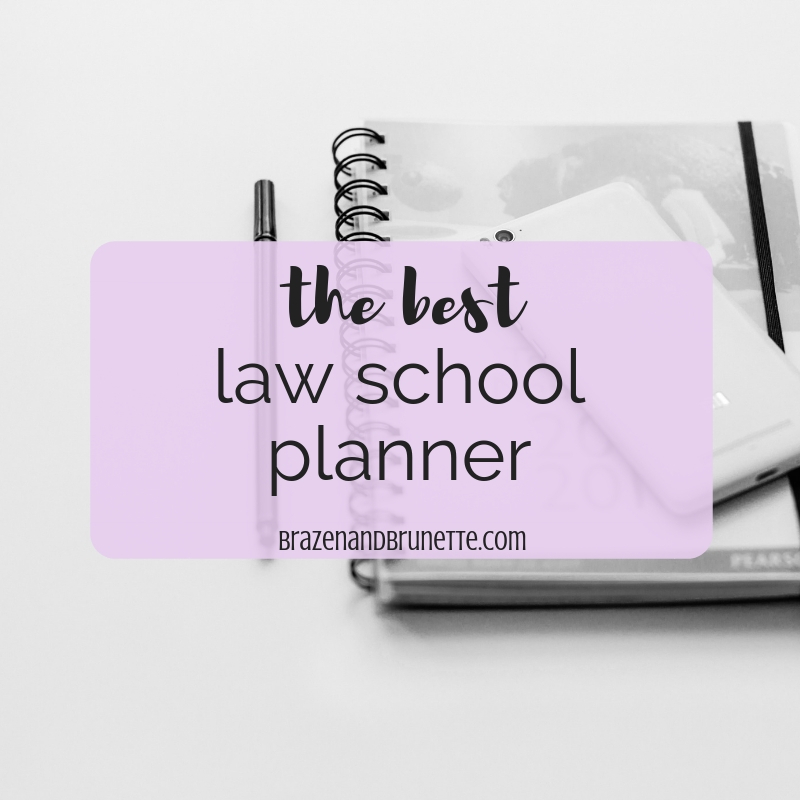 Before I picked a planner for law school, I did some good ol' Pinterest research, and again wasn't quite satisfied. 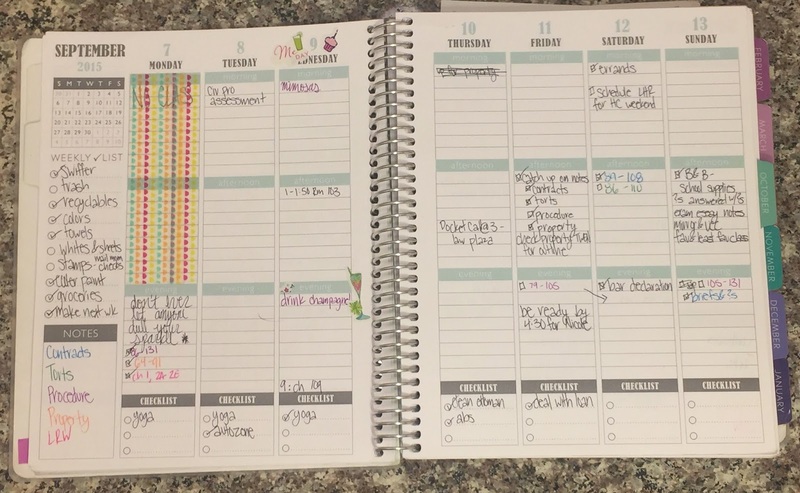 Almost every post I came across that was reviewing and comparing planners was by someone who was juggling a family, blogging, and a business. 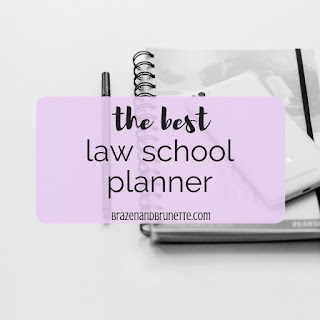 So, here is a planner review by a law student for law students :) I'm going to go Miss USA style and go from my least to most favorite. These are basically the same planner layouts, so I'm grouping them together for 3rd place. Typical sorority girl, I had a Lilly planner all through undergrad and loved it. I mostly used the month-at-a-glance to write out quiz dates, assignment due dates, and extracurricular activities. In the week-at-a-glance pages, you got like 8 lines each weekday and like 4 each weekend day to write out any little due dates. 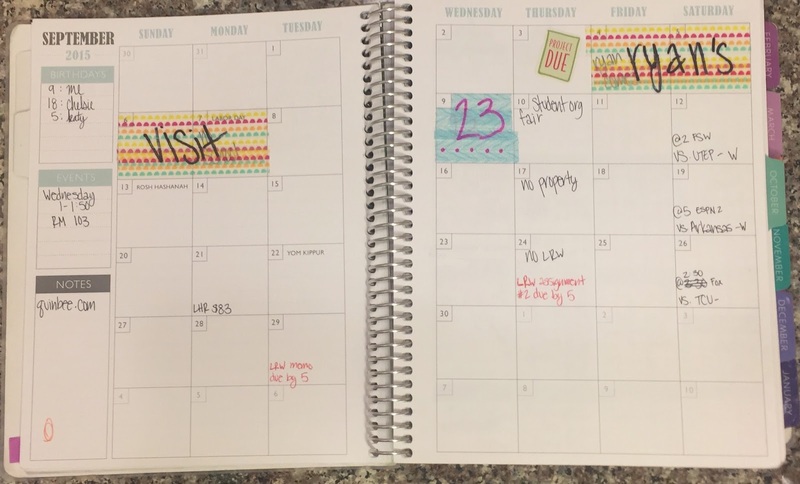 I actually started off my first semester with my Lilly planner, and found that it just wasn't enough writing space for me every day. In law school, I really don't need the big picture month pages because the only class I ever had any assignments for was LRW. 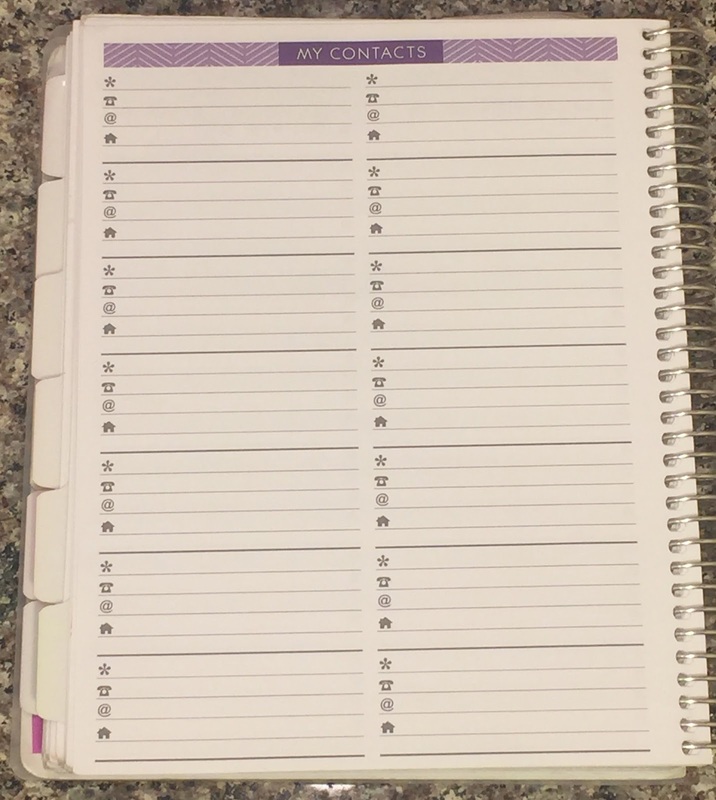 Instead, I really needed a planner that had a lot of room for the day-to-day assignments, like my daily readings. That's why I rank these 3rd, because I felt like I had too many pages that I didn't really need yet also didn't have enough room to write everything down. I also am not a fan of how these are 18-month planners. 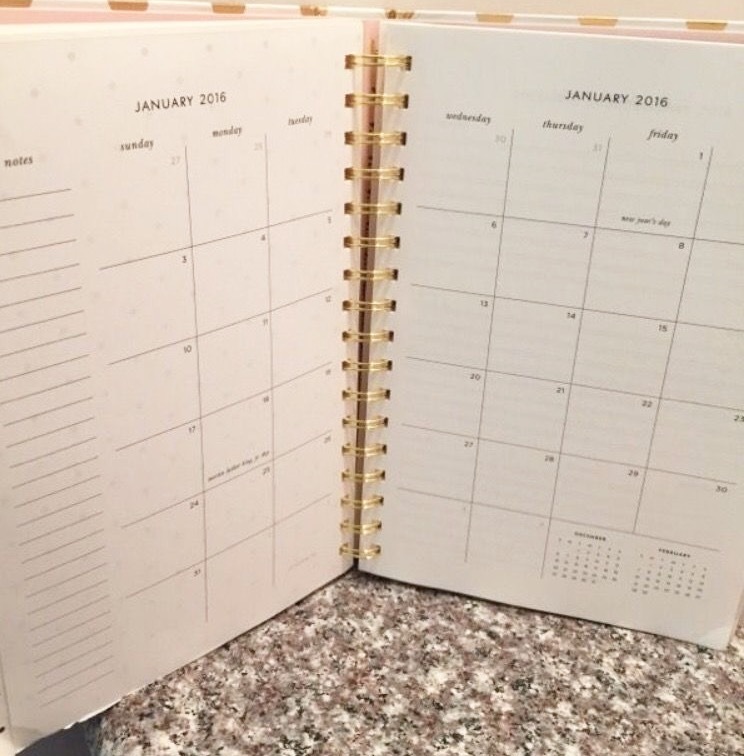 I understand how it's great because these work January-December for the rest of the world and also August-May for us students, but that means that you either buy a new planner with 6 months left in your old one or have to buy a new planner and skip past the first 6 months. However, this is just my type-A personality coming out. 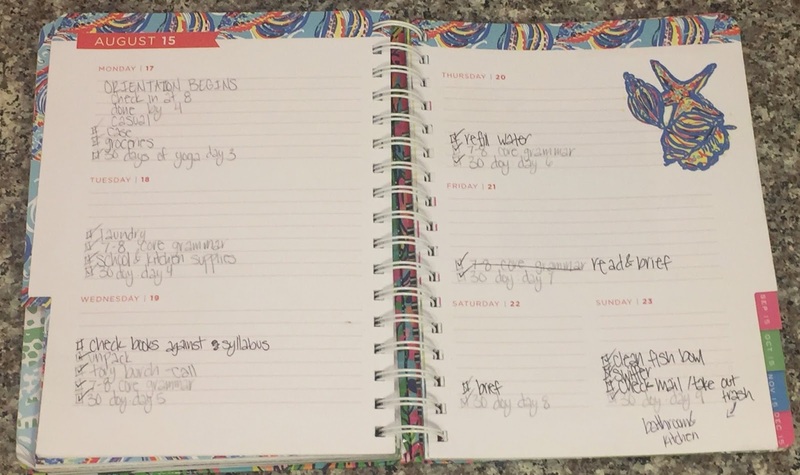 One of my roommates last year was in grad school for marketing/retail and had the jumbo Lilly planner and it seemed to work out just fine for her. 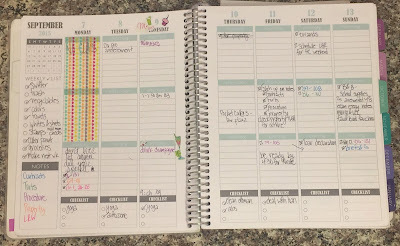 Another one of my friends is also in grad school, but for accounting, and loves her Kate planner. She used to have a Lilly one but switched to Kate because she said they looked a little more professional by having solid, monochromatic stripes instead of neon floral or nautical motifs. Speaking of design, I don't like how you can't customize these at all—I even had to buy a monogram decal just so that I could make it a little more mine. 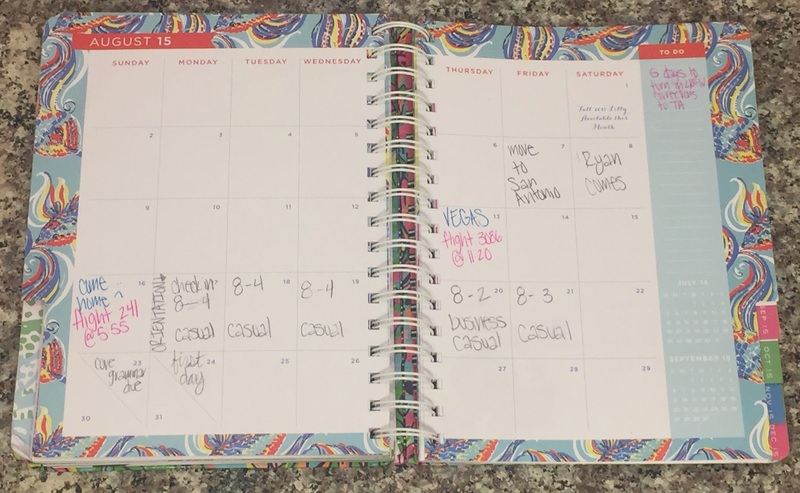 My other roommate last year was also in accounting grad school and she went on and on about how much she liked her Erin Condren planner better than Lilly or Kate because it divided every day into morning, afternoon, and evening so it gave her tons of space to write down everything you have to do that day. She's what convinced me to upgrade from Lilly so that I'd have more than just a few lines each day to write out what I need to do. You can customize these to have each day horizontal with a few lines for each day (like Lilly and Kate), vertical and broken down in morning/afternoon/evening, or vertical and broken down by hour. You can also choose a color theme, if you want it to last 12 or 18-month, and add your name, initials or a picture. As far as further personalization, there's basically an EC cult going on at Pinterest. Personally, these jam-packed planners full of washi tape and stickers and everything give me anxiety because, to me, a completely filled planner is just nothing but a never-ending to-do list. This is also why in my planner pictures, my days are pretty plain. The reason why I rate EC as 2nd is because of the price. I almost was about to bite the bullet and just buy one when I realized that I couldn't monogram it. This is silly, I know, but if I'm going to pay $50 for a planner, then it better be exactly what I want. 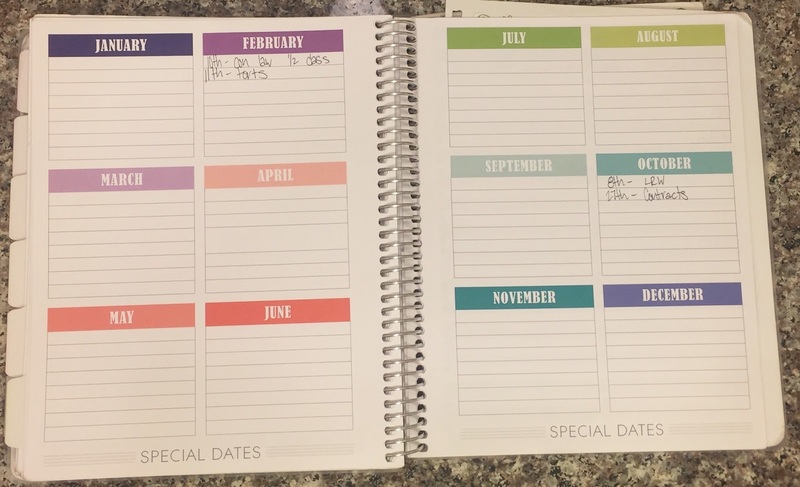 Erin Condren is actually a fellow Delta Gamma so I felt a little guilty getting a knock-off, but I searched for a cheaper alternative and found a planner that I truly love. 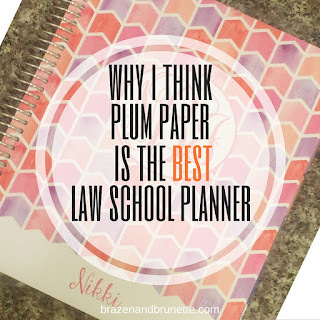 Plum Paper is my favorite planner for law school because it has everything I want and the base price is a lot better. 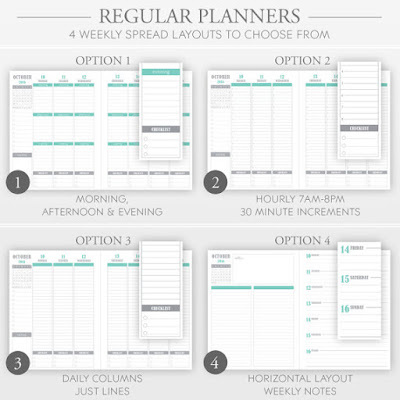 This is very similar to an EC planner, but has just a little more options to personalize it. First and foremost, you can monogram it. 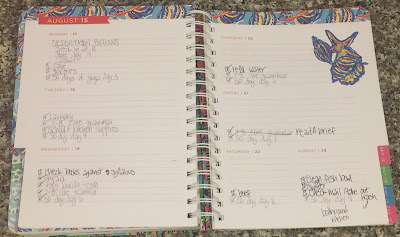 I loved the style of my planner from last year (this is the one I got), that I almost ordered the exact same style again (but then I found in love with this for this year). 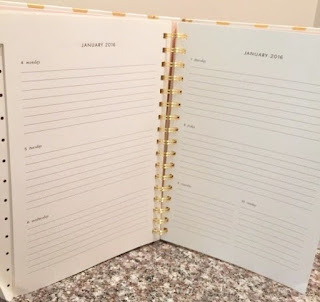 I also think this is the perfect planner because it's a 12 or 18-month planner, but you can choose what month you want it to start in so you never end up wasting months. First off, this is just the normal planner and not the student planner. I like how those have the option to break down your day into classes, but I don't feel like this is the best set up for M/W and T/R classes or for classes that finish after a semester and are replaced with new ones. So, as for the weekly layout option, you have 4 to choose from. I chose the morning/afternoon/evening option because I like how it essentially clumps my day together into class time, relaxation time, and studying time. Like I've said, this was the biggest deciding factor for me since I really don't use my month-at-a-view pages. Not only did I like these basic planner components, but I found use for every other part of this planner as well! For example, at the beginning and end of every month, you have a page just for notes. This really came in handy if I forgot my legal pad in a class that didn't allow computers or when I was in a meeting and needed a place to jot down notes where I would remember to go back and look at them later. It also had a page at the back for you to add some contacts. I know you're thinking that's what you have your phone for, but there's a good reason I use this. When people first find out that you're going to law school, they're going to mention some family or friend that they know that's a lawyer. When they do, you politely get that person's name, email, phone number, and maybe what type of law they work in, or where they are working now, or where they went to law school at. Then when it's time for you to start networking to find a job, you have all of these people in one place and know a little about them. Writing them down here instead of just your phone also helps prevent you from having to scroll through all of the contacts in your phone trying to remember what the name of a certain lawyer was. 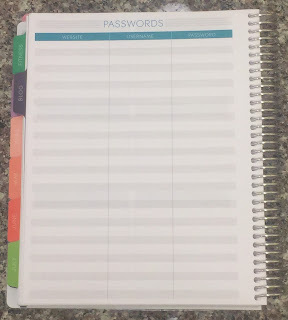 On the opposite side of this is a page for usernames and passwords. Obviously don't put any important information here, but it's a great place to store your law school information instead. For example, in mine I have my login info for Lexis, WestLaw, American Bar Association, etc. If someone has my planner and wants to log in to these, all they're going to get access to are cases that I've saved or the latest bar passage rates, so I'm not too concerned. 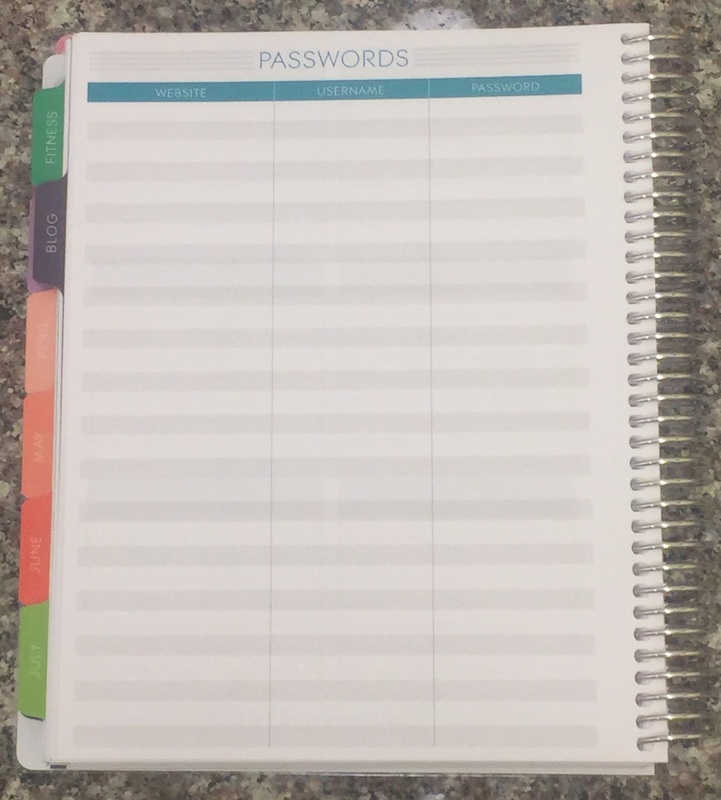 This is handy because I always have my planner on me so if I ever forget a password I can easily look it up. Another great section that I use is their special dates section at the end. 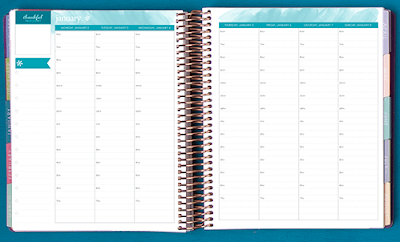 Because this has a place where you can write about all of the months at once, it's a great place to keep track of what days you missed what classes. I do this so that I never have to worry about my grade being docked for missing too many classes and so that I can keep myself in check on how often I skip. 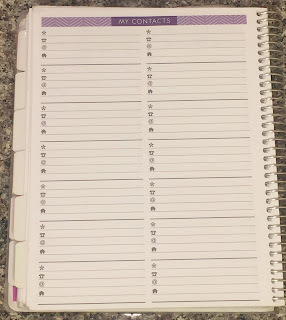 This is all what comes standard on the planner, but I did get one add-on last year. 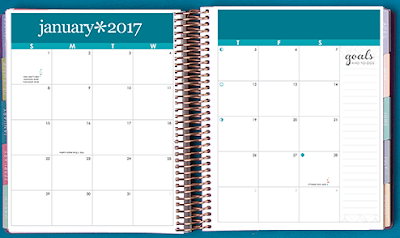 For $2, you can get a to-do list added at the back of every month. 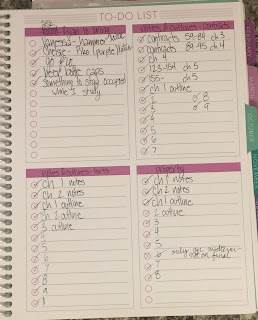 Although every day comes with 3 to-do's, and every week comes with 10, I used those for mostly chores and used the bigger ones at the back for school. Since these are broken down into 8 sections (4 on the front and 4 on the back), it was great to assign one section to each class to keep up with what I needed to do for that class each month. This year, I added that again and added two more sections. First I added a whole fitness tracking section that was only like $4 because I had wanted to put it in my last planner, but was worried that someone might see my daily weigh-ins and that's a little too personal for me to be sharing. However, this year I realized that people only see what page you open in class so as long as I'm not writing down my weight in class, that info will stay safe. I added this because I'm starting to focus on my health more, and hope that this will be a way to keep me accountable. Lastly, I added a blogging section that was like $4 because sometimes something will happen in class and I realize that I want to write about that here, and jotting it down in my notes section started to get pretty messy. I really hope some of you start blogging about law school and will end up needing this section, too! So, the total cost for all of this personalization was $50.75 with shipping. I know I scoffed at EC for being this much, but I feel like I'm getting exactly what I want. 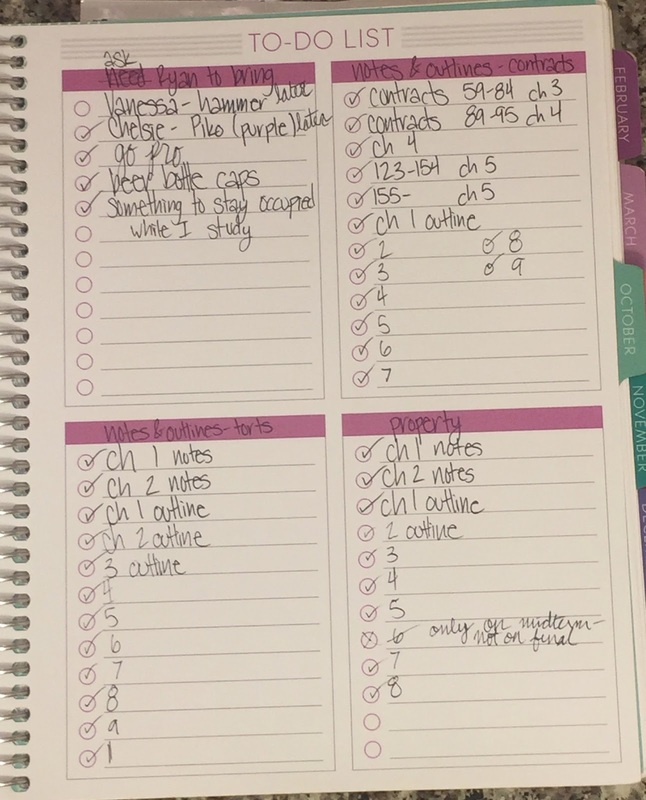 There's also a lot more add-ons that I contemplated getting such as extra notes pages, a checklist graph, a home planning (bills) section, and a monthly cleaning chart, but I decided that what I have is probably good enough for now. But if I end up wishing I'd had those, there's always next year. I can't stop spending money on my planner, lol. 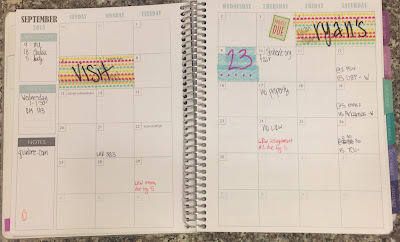 I bought these planner bands because I ended up missing how my Lilly Planner had a band that would save my spot in my planner. 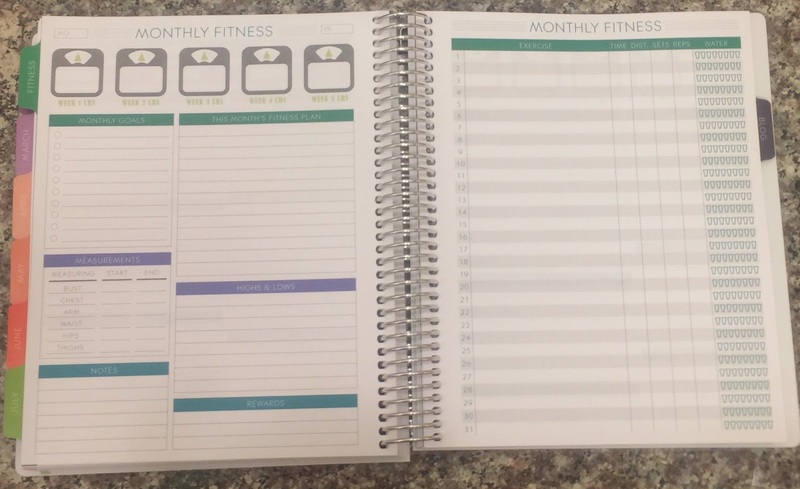 This came in a pack on 3 so I group from the front cover to the week I'm on as one section, the back of the planner to the month I'm blogging in as another section, and a couple of pages in the middle to the month I'm recording my weight on as the third section. This way I'm never flipping around trying to find the page I need. I also went ahead and got these college planner stickers. 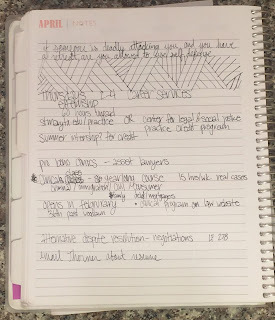 I use these for the month-at-a-glance so the important dates (like a final, registration opening, even book buybacks) stick out from the rest of my scribbles. Because I ordered these from Etsy, I could customize these and in the notes to the seller, I just requested that she use a pink/orange/purple color scheme that matched my planner more than the original color scheme in the listing. I love these so much that I'm currently looking for more perfect stickers because I clearly have a problem. I bought these felt-tipped pens so that I could take more colorful notes, but I also use them every day in my planner. 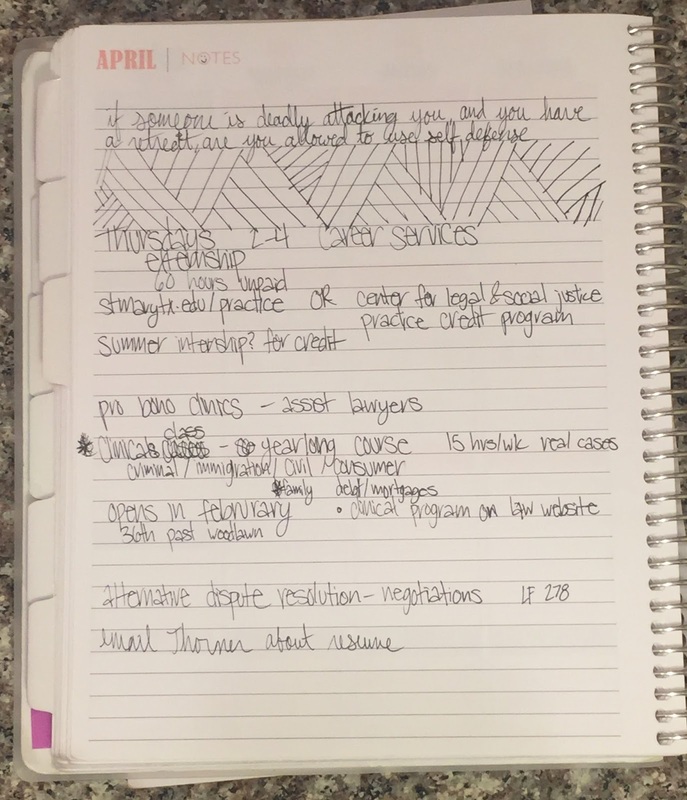 Color-coordinating my planner by each class, pro bono hours, and organization meetings just further helps me be organized. For example, if I don't see anything written in orange for that day, then I automatically know that I don't have any assignment for my Wills class. As you can plainly see (ha), I am not really a planner person that get's really into these. I use my planner more for function than as an accessory--its only purpose is to make sure I read what I need to read and pay my bills on time. Also, another reason why I decided to make this review so early is that when I ordered my planner, the estimated shipping time was about 3-5 days, and I noticed that it's already slipped to 5-7 days. And when I ordered mine last July, it took a full month for my planner to be made and shipped. If you're planning on getting a customized planner, I'd start looking for one now to make sure that you get it in time for orientation. I only reviewed these 4 because they're the only ones that I've researched/had personal experience with. If you know of another great planner for school that I missed, by all means comment and let me know! Update: Thanks for all of your suggestions! I tried them out and compare/review them in this new post! Wow! Loved this post. I've been thinking about what planner to get for the upcoming school year, and your post definitely helped me narrow it down. Thanks Rachel! Btw, I checked out your blog and loved it. Good luck with studying for the LSAT and applying to law school! I used the Day Designer during my 1L year and ordered another one for 2L year. They are normally around $60 but they have done collaborations with other companies and they are $25. 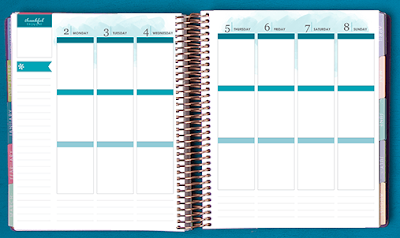 The daily/monthly planner has a separate page for every single day and each day has a 7-8 schedule, a to-do list column, a note column, an inspirational quote, and a daily gratitude box. Everyday I put in all of my classes, meetings, etc. and then put assignments and other things in the to-do list and then things like directions to a meeting, or random thoughts in the note column. 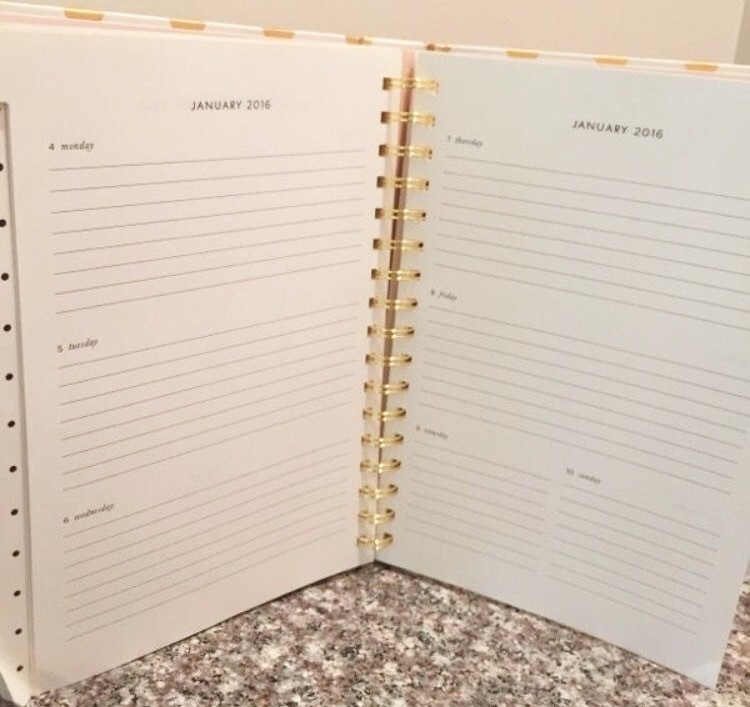 There is also a month calendar and blank pages for notes at the begining of every month. It isn't customizable but for $25 it is worth it and I just bought a monogram sticker from etsy for the front! Thanks Olivia :) I'd heard of that the Day Designer before, but didn't think it would be enough for everything. I'll definitely look into it! I just ordered mine! I would never have thought to spend that much on a planner, but when I realized how much of a planner I am and how amazing this custom made planner will be for me it is so worth the money! I am so excited for it to come!! Thank you so much for the recommendation. Erica, I checked with Plum Paper and I was mistaken-- the code only lasted through the end of June. I'm so sorry that was a total mixup on my part! I've updated my post so it's clearer to other readers as well. Passion Planner is my personal favorite. You can't get it monogrammed but its great for the busy law school life and jotting down daily homework and to do lists. Thanks for the suggestion! I've heard my friends mention that they use Passion Planner so I'll make sure to find one to play around with! You should check out The Happy Planner!! That's what I use. 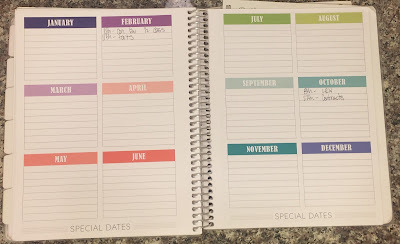 I used an Erin Condren for my 1L and 2L years, but 3L year I wanted to try something new, and Happy Planner is AMAZING. They come in varying sizes, and I got the classic. It's normally $29.99 but you can use 40% or 50% off coupons from Michael's and get it for $15-$18! Hobby Lobby sells them too. Thanks for your suggestion Katie, I'd actually never heard of the Happy Planner before you. I'm planning on testing all these out next semester and doing a follow-up post, so I appreciate your tip on using a coupon so I don't overspend! Loved your post! I just ordered this planner. I'm starting my 1L year this august. Can't wait to try it out!!! Thanks Rebecca! 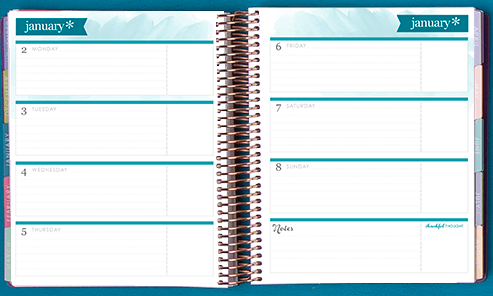 I just ordered my third planner so I'm sure you'll end up loving yours! But good luck this fall!! Hi Nikki! 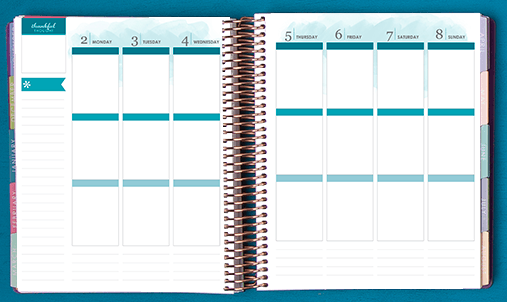 Is your planner the 7x9 or the 8.5x11? I'm designing my planner now and I can't decide which size to choose! By the way, I love your blog! I'm starting law school in August and whenever I have a question about something I check to see if you have written anything about it! So great! Hey Maria! I busted out my ruler to double check for you and I have the 7x9. I'm not positive but I think the 8x11 one is about the size of a jumbo Lilly planner, so I hope that helps you visualize the two so you can decide. 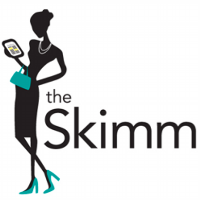 I'm so glad I can be answering your questions because that is exactly why this blog was created!! Shoot me an email if there's ever a question you have that I haven't answered! Thank you! Do you think that size is more than enough for everything? Hi Nikki! I loved reading this post! 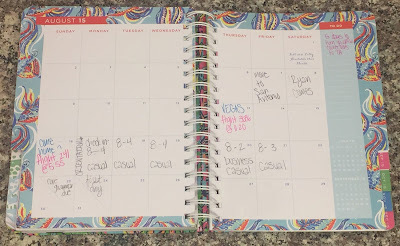 I've tried out Lilly Pulitzer and Erin Condren planners, and I've even tried to do bullet journaling so that I could truly customize what I needed in a planner at the spur of the moment, but having to take time to set aside to draw out all those lines and what I wanted just wasn't conducive for my lifestyle. I midway through the year migrated to a bloom daily planner, which is fine for at the moment but I definitely do like the customization of the plum paper planners. I was wondering, does the coil for the spine every get in the way of you writing things in the column right next to it? That's the problem I seem to be encountering with all planners I've tried. 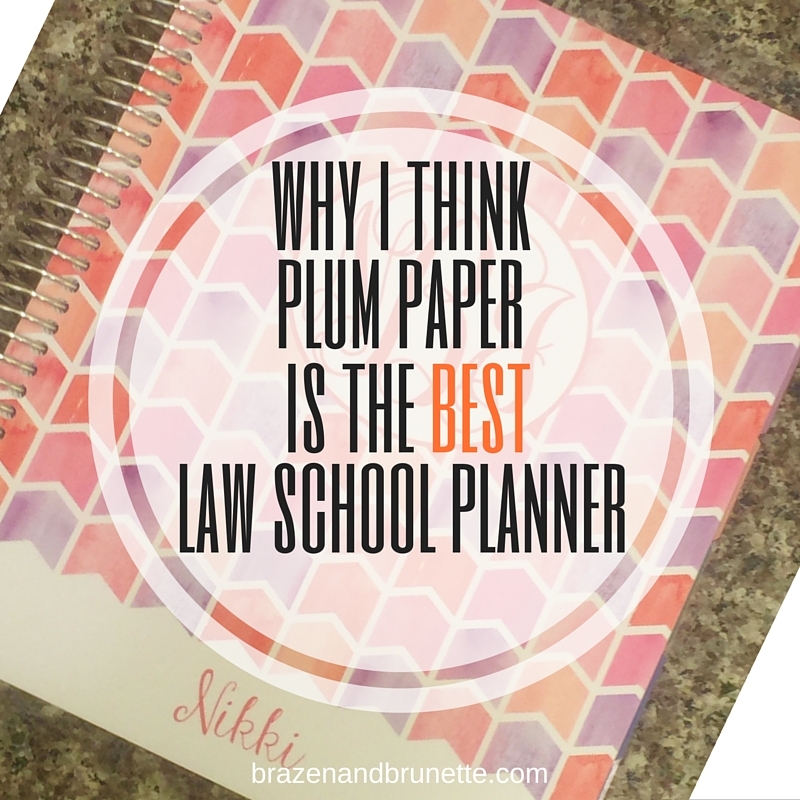 Wanted to see if you've noticed this problem with your own plum paper planner?